Sometimes when you’re watching a movie, you get to a spot where you have to give them points you’re not sure you’ll be able to entirely justify. William Eubank’s Love is such a film. At 84 minutes, it has a multitude of ideas that zip by you at a thousand miles per hour, in what seem like chunks of ten or twenty a piece. From some of the best visual effects I’ve ever seen on a movie with a budget under a million dollars (and many over that, too) to a grand lead performance that everything else is built around, there are many, many, many things that need to be unpacked here before a final opinion can be formulated. There’s hardly a “straight” moment in the entirety of Love. The closest you get are the first scenes in the space station. Everything else is either a depiction of a slow descent into insanity, a video of an interview, a flashback to the Civil War, or, once again, the last fifteen minutes, which more or less defy basic verbal or written description. And despite all the wonky visuals and flow, you always feel like there’s a clear inspiration for some of the more unique shots – 2001: A Space Odyssey seems like a particularly obvious source for a fair amount of it. The movie’s appearance and subtext are pretty dense, where despite the short runtime, it proposes thoughtful questions on the societal nature of humanity, history, and the future, despite the fact that the slim length also gives birth to the issue that it doesn’t elaborate in all of its ideas in quite the way the film (and we) want it to. Despite a smattering of other performances, most notably a group of Civil War reenactors for their respective scenes, Gunner Wright takes center stage in Love. The acting from him is absorbing and layered, with the character’s isolation and subsequent insanity coming through very well, most notably in a scene where Lee plays cards with himself. Eubank cuts back in between two shots of the actor sitting on opposing ends of a sill in the space station, with increasing frustration on both ends, at once entirely naturalistic and effectively unsettling. Perhaps I missed it, but I never did figure out why the title of this movie is Love, perhaps aside from one of the talking head interviews and the end of the voice-over that plays during the closing credits. Take nearly any scene of this movie, and you realize that there is an exponential amount of material that is intended to exist. Whether or not it does or whether or not it is realized are entirely different matters altogether, and while viewers should know that the film sometimes comes up short in those respects, this shouldn’t push you away. 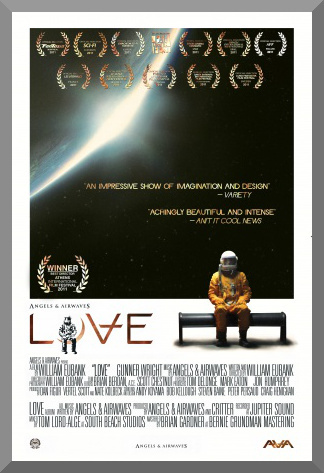 With writer/director/cinematographer Eubank’s still mostly full vision, great acting from Wright, awe-inspiring visuals, especially with its limited budget, and a solid score (from the band Angels & Airwaves, who also produced the film), Love is still a worthwhile movie for those in search of a unique, ambitious, and thought-provoking project.